Paxiom Group is an experienced team of packaging machinery experts that offer the most significant range of packaging equipment in the industry. Our tray packing systems are engineered to cater to any of your production needs. 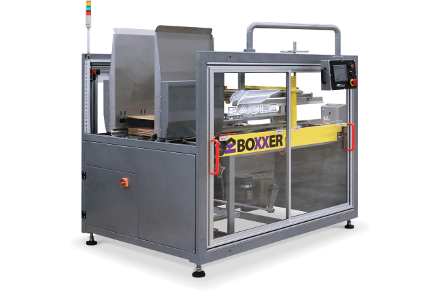 First off, we have the Boxxer All-In-One Pick & Place System designed to reduce labor costs by eliminating manual packing stations. This servo-driven case/tray packing machine automatically erects and forms a corrugated case or tray. Using vacuum cups, tray blanks are pulled and erected. Meanwhile, the minor flaps are folded into the box and glued down. During the erecting process of the case, the product will enter the staging area. Once the product is staged, it will now be picked up and transferred into a case or tray by the Pick & Place system. Take note that the number of layers required will determine how often the case has to be loaded. After the product is loaded according to your pack pattern, the case/tray will be conveyed to the sealing station. Using either tape or Nordson glue system, the minor flaps will be folded over the top of the case and the case will then will then travel under a set of compression rollers sealing the top of the case. With this servo-driven tray packing machine, you can now expect a more consistent, quality, and higher throughputs. Standard features include a heavy-duty, welded tubular steel frame, quick size change-over, Venturi vacuum technology, Omron programmable logic controller, one (1) end effector, one (1) pack pattern, color touchscreen, infeed conveyor, and more. Last is the BoxxPak Case Packing System, an efficient and flexible case packing system that is known to increase production rates, streamline your packaging process, reduce human loading errors, and improve operator satisfaction while reducing stress. Our case and tray packing machine under the BoxxPak brand combines case erecting, hand packing and tape sealing into one compact work cell. This smartly designed packing system is equipped with an automatic indexing system that is responsible for effectively positioning of cases, trays and product to optimize the operator’s comfort by minimizing repetitive wrist and arm motions. Moreover, it can operate on a wide variety of product sizes, shapes, weights, and materials. These can be easily packed in a large range of case or tray sizes. Available in up to 4 operator stations, this tray packing machine provides the ultimate flexibility and productivity. Its loading process starts with a corrugated case or tray being erected and formed. It follows with the transferring of incoming bags, boxes, cartons, pouches and other packaging material to the staging area. After the product staging, the operator will now transfer the product into the case or tray. Then the product will be loaded according to your pack pattern. Once properly loaded, it will be conveyed to the sealing station. This is where the top flaps are folded and applied either with glue or with tape. Finally, you will now have a finished product ready for shipping.